The next technology revolution has arrived. It’s affordable, easily deployed and renders immediate benefits and savings. A few years ago we saw the death of typing pools. we all knew someone who worked in a typing pool as a typist. These typing pools were rapidly replaced by placing printers in convenient locations, driven by desktop “typing” applications like WordPerfect and soon thereafter Microsoft’s Word. Times are once again changing with the rapid mass adoption of smart devices running on platforms like Apple’s iOS and Google’s Android. Users are already used to these smart devices, and are happily spending currency on games and connecting to social media and managing their emails. Up to now, there have been a lack of decent, affordable business tools on these smart devices. Noscotek, specializing in business process optimization, has partnered with various leading mobile solution providers and have engaged with customers offering the next big change in the way we manage business, “Digital Paper”! Everyone is talking about going paperless, but let’s be honest, the reality of moving over to a digital environment is a big task. “Digital Paper” or electronic forms are a great way to keep the same business process but to easily move paper to a digital format. An easy transition and a quick win with huge benefits. 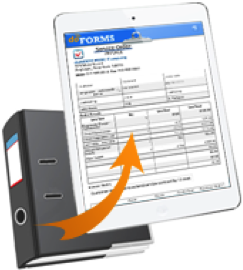 Electronic forms allow your commonly used paper forms to be digitized on smart mobile devices like smart phones and tablets, without the need to print at all. These digital forms are completed with user guiding intelligence to prompt users with relevant questions. The answers and data these users complete on their mobile devices are populated on the customer’s own “digital stationary” and sent real time back to the office in secure PDF format. Get information instantly as field workers complete tasks – forms are back at the office before they are. General Forms: Any form currently used within an organisation can quickly and easily be replaced with an electronic form. All forms will follow a business process and will be routed to the correct person. Think Leave Forms, Job Cards, Expense Claims, Timesheets, the list is endless. Dispatching work to employees: The power of a well-managed mobile work force is within reach with electronic forms and will give you the ability to dispatch and manage your field-based sales and service staff. Dispatch work order forms containing critical job details to mobile workers in real-time and know exactly when the device received the work order and when your employee viewed it. Track employees: Sometimes it is important to know where your employees have been. Electronic forms can provide a GPS audit trail that documents and supports their activities. It also allow images, video and audio that can be recorded whilst performing certain tasks. Form retrieval: Need multiple people to work on the same form? With electronic forms, a form that was submitted by one person can be retrieved wirelessly by another person. Guess it’s the same as asking the price of a car – it all depends. Number of users, forms, devices, etc will play a role in determining the price but it will definitely not break the bank and will most likely be cheaper than your current cost of paper, printing and business inefficiencies. Our quotes are free and you will qualify for a 30 day free trial – so you really have nothing to lose. FREE consultation meeting – Let us help you! 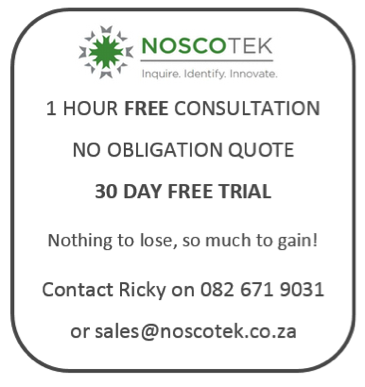 We understand business processes and we understand technology and we would love to help you grow your business – give our awesome sales guy (Ricky) a call on 082 671 9031 or email him at ricky@noscotek.co.za – we offer a 1 hour free consultation and we are confident that we can change your life.